We are proud to introduce our partnership with Rubbabu, a new natural non-toxic toy manufacturer. Click here to read more about natural rubber toys for babies. Rubbabu toys are made from simple, safe ingredients that are carefully chosen from around the world with no fillers or additives. 97% of each toy is made of natural rubber - a strong, sustainable, hypo-allergenic, anti-microbial and flame resistant material. 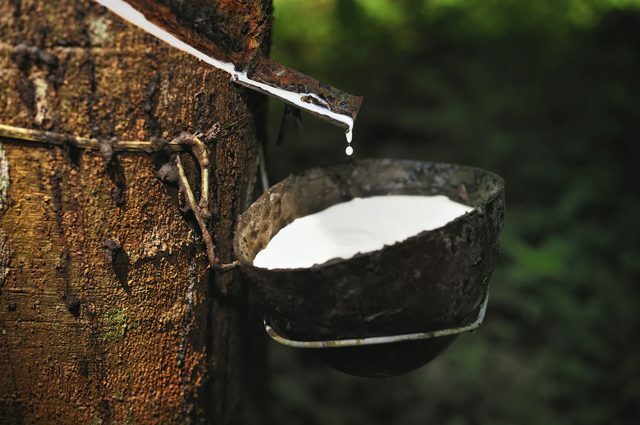 The natural rubber is sourced from rubber trees humanely. None of these trees are cut down or damaged during this the extraction process. Natural rubber is 100% biodegradable. The natural rubber is foamed, poured into molds, then carefully baked at high temperatures to harden. The remaining 3% of each toy is superior nylon fiber sourced from Spain covering the surface. This nylon provides a protective durable outer layer to the natural rubber. Very thin and small natural fibers are used to create the soft exterior surface. These fibers are flocked on and stick straight out at right angles. Imagine thousands of these fibers standing very close to each other. This creates the soft velvety surface that is so much fun to touch! The exterior paint is nontoxic and carefully crafted in the factory using non-toxic American pigments. Rubbabu toys are produced eco-friendly and biodegradable. Each toy is handmade with love and care in India. The factory recycles all raw material waste. They also optimize all materials, processes and facilities to conserve resources and eliminate waste at every stage of development. Rubbabu employs more than a hundred people and provides them with good safe and fair jobs. The founder, Rahul Butalia, runs the factory with respect and equality. He is proud to be certified from ICTI - the International Council of Toy Industries for ethical manufacturing. Rubbabu provides a healthy and safe working environment for all it's employees taking into account ergonomics and safety. Their employees have access to financial and medical aid from the company, in addition to health insurance and employer contributions to their retirement savings accounts. What is most important is that they value and respect each other, and everyone works as a team. Some ingredients are sourced from similar responsible companies in Spain, Switzerland and America. These soft and squishy toys are made completely from safe materials that cause no harm. Rubbabu constantly strives to provide safe products, and they take that responsibility very seriously. Among other things, they ensure their products are tested according to international safety standard including EN 71 Part 1,2,3, ASTM 963F 16 CFR, CPSIA stipulations for soluble heavy metals, and tests for phthalates. Rubbabu toys pass all international safety tests for all ages. Everything that goes into these toys is completely child-safe. Rubbabu toys are safe for everyone in all age groups from newborns to older toddlers. We recommend using these toys when your child reaches at least 6 months, when they will be able to play more with them. Rubbabu toys are excellent for providing essential and valuable tactile and sensory stimulation. Children and adults with special needs find these toys helpful. Kids love their Rubbabu toys. The safe material and simple shapes and designs work excellent. Kids love the bright colors and texture, and actually normally form a bond to their Rubbabu toys. Simply wipe clean with a damp cloth. The surface is a high quality nylon which cleans easily and does not fade. Limited quantities available. Click here to shop now.